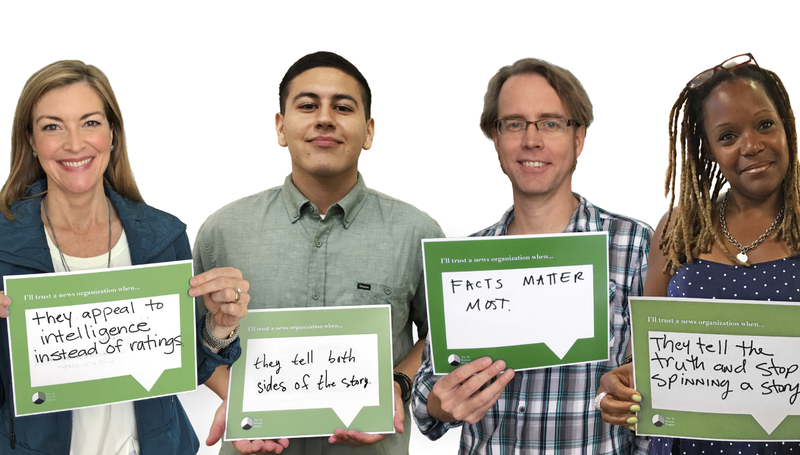 Newsrooms should become more authentic, diverse and positive to gain the public’s trust, according to a series of community conversations across the country. Trust in the media is low. In fact, according to a 2016 Gallup poll, only 32 percent of Americans had confidence that the media reports news “fully, accurately and fairly.” The University of Oregon further explored what trust means to different people. The researchers’ goal? Turn these definitions into strategies to improve the public’s relationship with news. Researchers talked to people in communities across the political, economic and social spectrum. Participants felt these six “conditions of trust” were necessary for trust in news organizations: authenticity, transparency, consistency, positivity, diversity and a shared mission. Researchers surveyed communities in Rico Rivera, California (91 percent Latino), the Mattapan neighborhood of Boston (80 percent black), Vienna, Illinois (95 percent white), and Oxford, Mississippi (72 percent white). Researchers surveyed communities varying in income level and political affiliation. The research team held conversations in community gathering places for a more authentic conversation. The research team interviewed 54 people. Some are active news consumers and some don’t consume news.